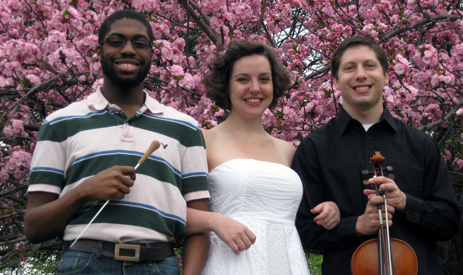 Goucher students Arreon Harley, Stephanie Barnes, and Michael Polonchak will be featured at the Goucher College Orchestra Concert on April 28th. Although I perform concerts all year long, there’s always something special about those that take place in the spring. Teachers of all stripes know what I’m talking about. It’s the culmination of the academic year, a chance for outstanding students to shine, and a time to marvel at months (and sometimes years) of progress. The week after the GCO concert I’m looking forward to conducting the Frederick Symphony’s spring subscription concert on Saturday, May 8th featuring flutist David LaVorgna in Robert Beaser’s Song of the Bells along with Debussy’s Prelude to The Afternoon of a Faun and Tchaikovsky’s Symphony No. 4. But in the meantime, I’m playing the trumpet parts for Handel’s “Let the Bring Seraphim” on Stephanie Barnes’s senior recital at Goucher tonight and “The Trumpet Shall Sound” with Robert Cantrell at Grace Methodist tomorrow morning. Never a dull moment! the photo shoot turned out well! i want to see more! thank you again for everything last night! people were raving about you. what a talented, wonderful lady you are.